Jeffrey Brown: "I want to deliver a more nimble, energetic and opportunistic Ally." Title: CEO, Ally Financial Age: 42 Joined: March 2009 Key roles at Ally: CEO of Ally's Dealer Financial Services unit, March 2014-February 2015; senior executive vice president of finance and corporate planning, Ally Financial, June 2011-March 2014; corporate treasurer, March 2009-June 2011 Education: Executive master's degree in business, Queens University of Charlotte (N.C.); bachelor's degree in economics, Clemson University Business reputation: Hard-working, hands-on. "I love the guy," Dave Kelleher, owner of David Chrysler-Dodge-Jeep-Ram in Glen Mills, Pa., told Automotive News. He met Brown in 2012. "I've never been with him at any time without him asking 'What can we do for you?'" Kelleher said. "He knows all the roads and all the rivers run through the dealers. That's the money ticket for Ally, and he knows that." On his nightstand: The Attacker's Advantage: Turning Uncertainty into Breakthrough Opportunities by Ram Charan Extracurricular: Jogging. "I made a commitment to take better care of my health about a year ago. I lost 51 pounds," Brown said. He found time at this year's National Automobile Dealers Association convention in San Francisco to jog across the Golden Gate Bridge and back. "I don't love heights. But that's off my bucket list." Personal: Married, with 3 young children, J.B., as he's known, commutes from Ally headquarters in Detroit to his home in Charlotte, N.C., as often as possible. "U.S. Airways knows me very well." 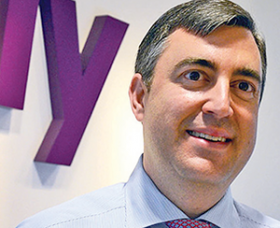 New Ally Financial Inc. CEO Jeffrey Brown must hit the ground running. Along with a sizable to-do list, he must deal with a shrinking share of business supported by incentives from former parent General Motors. The decline in GM business is a long-term trend and an obvious priority for Brown. But the automaker's recent move to direct all brand lease incentives to GM Financial, instead of sharing them among GM Financial, Ally and U.S. Bank, was unexpected and has forced the issue front and center for Ally. The stakes are high. In 2014 GM-subvented leases accounted for $9.3 billion, or about 23 percent, of Ally's $41 billion in total originations. Including $4 billion in GM-subvented loans, subvented loans and leases from GM accounted for 33 percent of Ally's originations for the year, down from 35 percent in 2013. Including subvented loans and leases, plus standard-rate new- and used-vehicle loans, GM accounted for 63 percent of Ally originations in 2014, down from 65 percent in 2013. "If we are unable to successfully offset these declines in our business, these actions could have a material adverse effect on our business and results of operations over time," Ally said last month in its annual filing with the Securities and Exchange Commission. It also said GM has not indicated any plans to shift its subvented loan business. Some analysts worry whether Ally can replace the GM lease business. Chris Donat, managing director of equity research at Sandler O'Neill + Partners in New York, said perhaps Ally shouldn't even try. As some analysts have noted, the potential upside of fewer leases would be less exposure to residual value risk for Ally. "I think it might be more appropriate to downsize and concentrate more on the smaller U.S. market than they have done historically," Donat told Automotive News, referring to Ally's sale of its former overseas operations, mostly to GM Financial. The sale was completed in January. New Ally Financial CEO Jeffrey Brown has a sizable to-do list. Here's a sampling based on company reports, analyst reports and an interview with Automotive News Special Correspondent Jim Henry. • Improving interest rate margins. Ally is refinancing debt incurred at higher interest rates when the company was struggling during the economic downturn. Ally also is reducing its cost of funds by using a higher proportion of low-cost consumer deposits to fund auto loans. • Cutting expenses. Brown will continue to cut costs to fit Ally's smaller footprint. Ally had 6,900 employees at the end of 2014, down from 7,100 the year before. At the end of 2007, it had 26,700 employees. That was before Ally dropped its huge ResCap mortgage subsidiary and sold off its international operations. Brown said that Ally is "65 to 70 percent" finished with cutting annual costs and still has about $100 million to go. He said he wants to get that accomplished by the end of 2016. • Taking advantage of fewer ties to feds. Brown said Ally stands to benefit from repaying the rest of its U.S. government bailout and from the U.S. Treasury's sale of its remaining stake in the lender, both of which happened in December 2014. The government prohibited Ally's Dealer Financial Services unit to use Ally Bank deposits to fund loans for customers with FICO credit scores between 620 and 660, Brown said. The Dealer Financial Services unit still made those risky loans but used more expensive funding from parent Ally Financial. Brown said Ally in effect had to borrow those funds at an interest rate of about 190 basis points, or 1.9 percent, vs. a rate of 105 basis points, or 1.05 percent, for bank deposits. • Cross-selling. Brown wants to cross-sell products and services to Ally Financial's auto customers and Ally Bank depositors. "We talk about the customer base in silos. We have about 4 million retail [loan] and lease customers, 16,000 or 17,000 dealers, plus about 900,000 deposit customers. … We haven't really educated that 4 million-customer base of the other things that might interest them, what else Ally has to offer," such as a checking account, he said. By the same token, he said, deposit customers need to be treated as potential auto loan customers. • Floorplan. Brown plans to aggressively defend Ally's declining share of floorplan business with General Motors and FCA US dealers, a competition he called "hand-to-hand combat" during a conference call last month. • Cultivate automakers, dealers and Ally employees. "I'm very focused on growing revenues for the company, so I will continue to be focused on interacting with the dealer community. I recognize dealers are our main customers," Brown said. "The manufacturers play a role in this dynamic as well, so I will also continue to build relationships with the OEMs." With respect to Ally's employees, Brown said, "I bet I've been front and center with 4,000 or 5,000 of them" during his tenure at Dealer Financial Services. Meanwhile Donat and other analysts who follow Ally gave Brown, 42, high marks professionally. Cheryl Pate, an executive director at Morgan Stanley in New York, called him "a seasoned executive with hands-on experience" in a note announcing Brown's CEO appointment. Brown's resume at Ally Financial includes a three-year stint as senior executive vice president of finance and corporate planning and two years as corporate treasurer. Most recently he was CEO of Ally's Dealer Financial Services unit, the auto finance side of Ally Financial. The other side is Ally Bank. Before joining Ally in 2009, Brown was corporate treasurer for Bank of America. Donat said Brown deserves credit for taking analysts' questions in a Feb. 5 conference call, only three days after his Ally CEO appointment. "That suggested he has moved quickly," Donat said. "The timing was a surprise. The fact that it was him was no surprise." "What pisses us off" about GM's decision was that it excluded Ally from competing for GM lease business, Carpenter said Jan. 29. He also said he didn't see how the move would help GM dealers lease more cars and trucks. "In fact, I think they'll sell less cars," he said. And he minimized the effect on Ally. "What if all GM leasing goes away or, in reality, all incentive business?" Carpenter asked. "If all were to go exclusively with their captive, our plans put in place over a five-year period will allow us to offset any losses in originations." Four days later, on Feb. 2, Ally announced Carpenter would retire and Brown would take over as CEO effective immediately. In Ally's Feb. 5 conference call, Chairman Fritz Hobbs praised Carpenter for turning around Ally. He said Carpenter had been in discussions with Ally's board about succession planning for more than a year and that Brown clearly had been the designated successor. Hobbs said Ally announced Carpenter's retirement when it did simply because it wanted to get the fourth-quarter earnings announcement out of the way first. Ally Financial once had a lock on GM incentives. But GM and Ally started phasing out their exclusive partnership in January 2011, not long after GM's 2010 purchase of AmeriCredit Corp., which GM used as a basis for GM Financial. GM subvented loans made up just 10 percent of Ally Financial's originations in 2014. In 2008, it was 79 percent. Ally Financial used to be GMAC, GM's former captive finance company, founded in 1919. GM sold a majority stake in GMAC in 2006. As part of its government bailout, GM further reduced its stake, and in 2008 GMAC became a bank holding company, which later renamed itself Ally Financial. GM sold its remaining ownership in Ally in December 2013. That same month, Ally became a financial services holding company, which allowed it to stay in the business of insurance and F&I products such as extended-service contracts. Carpenter addressed the issue of shrinking GM incentives by continuing to do standard-rate business with the automaker and its dealers while building up used-car financing, plus loans for non-GM dealers. Ally followed a similar strategy when the former Chrysler Group, now FCA US, redirected all of its incentives to Chrysler Capital starting in 2013. Brown said he would keep diversifying. For example, in the Feb. 5 conference call he said Ally had "underachieved" in nonprime. The company's mix for nonprime loans in the fourth quarter was about 9 percent. "I'd like to see closer to 12 to 15 percent through time," he said. He also said he wants to cross-sell Ally Financial's entire customer base, encouraging auto loan and lease customers to open accounts at Ally Bank, and Ally Bank depositors to take out auto loans. "I want to deliver a more nimble, energetic and opportunistic Ally," he said. And part of that mission will be to find a way to work with GM. "I know we are a key partner to GM and GM dealers, we have over 100 years of history," Brown said. "I expect to have a constructive and beneficial relationship in the future."